Comments: The longtail salamander can reach over 7 inches in length and has a tail longer than its body. It has a broad dorsal stripe that is lightly colored and speckled with dark markings. There are 14 or fewer vertical folds (costal grooves) along the side of the body. 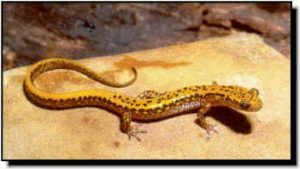 The longtail salamander lives in or under rotting logs, near groundwater seepage sites and under rocks along streams, especially in or near caves. It has been reported at Schermerhorn Cave in Cherokee County. This salamander is more likely to be found on land than in water. The males have swollen snouts during breeding season. The female produces one clutch of eggs each year that she deposits in a single row under submerged rocks. The larva is gilled and remains aquatic until transforming to the adult stage.